A portion of every Race Registration will help the BOYS & GIRLS CLUBS of the Colorado River. We are honored to be raising funds for a safe and fun place for over 1,000 kids in the community. Their after school and Summer day camp programs ensure that these young minds have a place to grow and achieve their full potential. By signing up and with any additional donations, you will ensure that these amazing children have a place to go, a place to feel safe, and place to succeed. 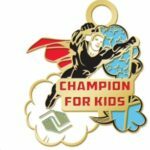 Raise $100 for the Boys & Girls Clubs of the Colorado River and get an exclusive Champion for the Kids Medal! But… did you know that there are thousands of kids right here in the tri-state area who need our help! That is why we are asking you to RUN LAUGHLIN for the KIDS! All funds raised will go to the Boys & Girls Clubs of the Colorado River and will provide after school and summer programs for kids which include physical fitness, homework help, character building, STEM and healthy snacks! But why stop at $100??? Prizes for the top 3 fundraisers!